Team 4272 Wins Tippecanoe District! 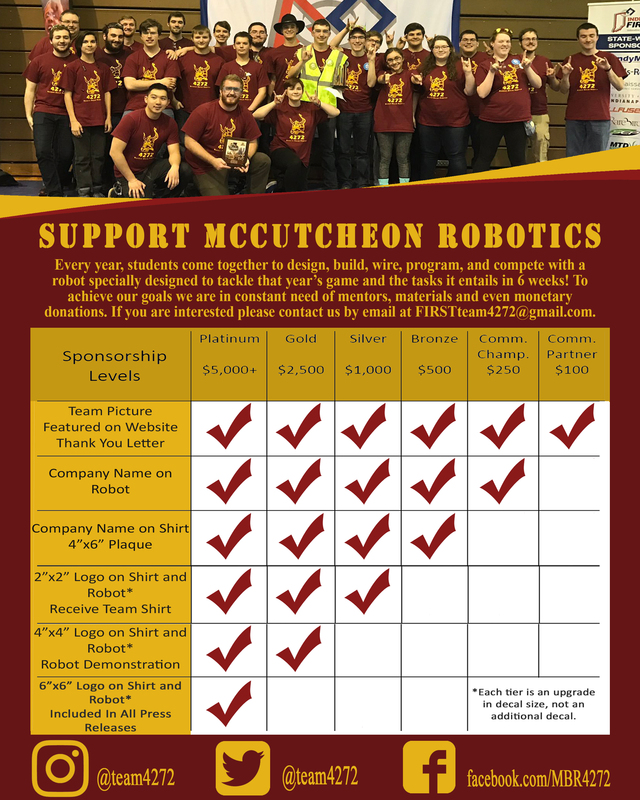 The McCutcheon Robotics team competed in the Tippecanoe District event last weekend at Jefferson High School. The team ranked 8th out of 39 teams through qualification matches and was selected by the 3rd seeded alliance for the elimination stage. The team progressed through the elimination rounds before winning in a 3 match final. This was… Read More Team 4272 Wins Tippecanoe District! [youtube https://www.youtube.com/watch?v=rrKCGdDJyME&w=560&h=315] We will be competing at: – St. Joseph District Competition – Tippecanoe District Competition See you on the field! We have been hard at work through the first week of the 2018 build season. Practice field, manipulator prototypes, and chassis CAD have all been completed. We have also started on chairman’s, programming and machining our chassis’s. Below you will find a video of our progress so far. For more detailed updates check out our… Read More Week 1 Update! Team 4272 competed once again at the Boiler Bot Battle this time bringing two robots, Bonnie and Clyde. This off-season competition, run by Purdue First Programs, was our team’s last before kicking back and waiting until build season in January. We were able to of made it into eliminations working hard one last time and… Read More Boiler Bot Battle! The McCutcheon Robotics Team is excited to announce they will be holding their 2nd annual Winter Workshops this December! We will be offering the following two separate camps on December 2nd as well as December 9th. Creation Station Workshop (5th-8th grade students) In the Engineering field, nothing will be done without the creation, or… Read More Winter Workshops! Thinking about having pizza for dinner? Great! On October 12th our team is holding a fundraiser at Hotbox Pizza on Veterans Memorial Pkway in Lafayette. When you go to order, mention our team and 20% of your order will go towards helping our team! We will also be setting up our robot inside if you… Read More Hotbox Fundraiser!